Woking will play a first away game since the last weekend of September and only a third since August as Alan Dowson’s side prepare for the first of at least four consecutive away trips. It has, for many reasons, been an unusual run of games for the Cards of late with eight of our last ten games being played at the Laithwaite Community Stadium – producing a five game winless streak in the league before Tuesday evening’s much-needed 3-0 win over Hungerford Town alongside impressive progress in the FA Cup through to a first round meeting with Torquay United. The Cards actually have a decent record away from home so far this season, with just one defeat and 11 points from six games, a tally which might have been higher were it not for late goals at Concord and Torquay – and Dowse will be hoping his team can enhance that record further against Chippenham. The Bluebirds have had a strange season thus far. In many ways they’ve exceeded expectations, after finishing 13th last season they currently sit in ninth place, two points adrift of the play-off places. They’ve also claimed some very notable wins with their seven league victories including successes over league leaders Billericay Town, as well as play-off chasing Concord and Torquay. However, they’ve been far from consistent, losing six times including recent defeats against Dulwich Hamlet and Dartford which have prevented them closing a five point gap to the Cards. With close to 80 goals having been scored in games involving the two teams so far this season it promises to be an enjoyable game so make the trip if you can and enjoy the action! The Cards made four changes on Tuesday night as Nathan Collier replaced Ian Gayle at right-back, academy graduate Charlie Hester-Cook made his first league start in place of Donovan Makoma, whilst Greg Luer and Duane Ofori-Acheampong replaced Max Kretzschmar and Paul Hodges in the front four alongside Nicky Wheeler and Jake Hyde – Luer playing just behind Woking’s loan striker in a 4-2-3-1 formation. Dowse will no doubt have been pleased with the performances of a number of his fringe players, particularly the two forwards, who helped contribute to a more cohesive attacking performance than has been seen in recent weeks. It does mean however that he has a number of selection headaches for Saturday when the likes of Kretzschmar will no doubt hope to feature. Jamar Loza could also be close to a return after his shoulder injury, whilst we await news on Oxford United duo Harvey Bradbury and Armani Little, who Dowse has spoken about aiming to retain on longer loans. Manager Mark Collier has assembled a strong squad which includes a number of players who have featured at a higher level in the past. On Tuesday, when they drew 1-1 with Oxford City, they started with on-loan West Brom goalkeeper Brad House and a defence which included George Rigg, Kieran Parselle, the experienced Will Richards who is often a danger at set-pieces, and Curtis Macdonald. In midfield was former Hungerford player Michael Jones and Bradford City loanee Callum Gunner, with Matthew Smith and former Fulham youngster Josh Smile out wide; up front was goalscorer Nat Jarvis, who has scored regularly at this level with Hungerford and Gloucester since leaving Cardiff as an academy player, and Nick McCootie who was previously with Bath City. A couple of the more familiar names in their squad are goalkeeper Will Puddy, previously with Salisbury and Bristol Rovers, midfielder Jack Compton who has had spells with Falkirk, Portsmouth, Hartlepool and Yeovil, and forward Yan Klukowski who was a regular for many years with Forest Green Rovers and in more recent years has played for Newport and York City. Chippenham’s ground is Hardenhuish Park which can be found on Bristol Road, the postcode is SN14 6LR, and it’s just under two hours’ drive from the Laithwaite Community Stadium. Chippenham Railway Station is located around three quarters a mile away from Hardenhuish Park and takes about 15 minutes to walk. The station is served by trains from London Paddington, Bristol Temple Meads, Southampton and Cheltenham Spa. Ticket prices are £12 for adults, £7 for concessions and £3 for juniors (if accompanied by an adult) – it’s a £1 upgrade for a seat in the main stand. The Cards have several more away games coming up with a trip to Torquay in the FA Cup first on the agenda next Saturday. This is followed by a rearranged mid-week game at Gloucester City and a trip to Slough Town. Our next confirmed home game, putting potential FA Cup, Trophy and Surrey Senior Cup games to one side, is against Dartford on the first Saturday in December. 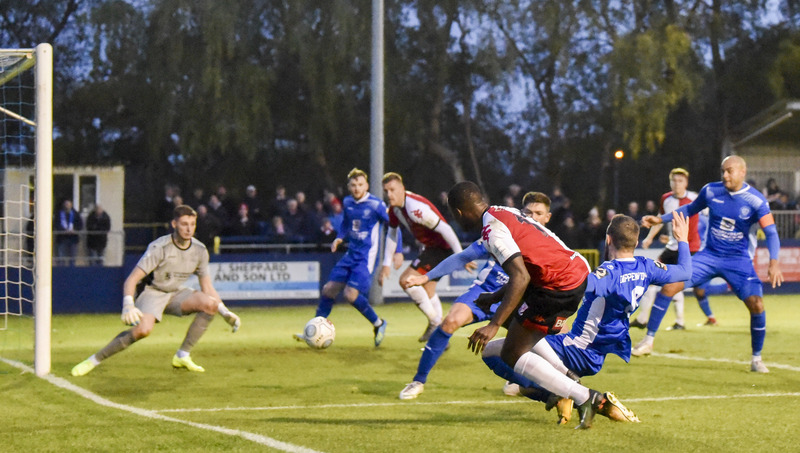 Woking fought back from two goals down to rescue a draw late against Chippenham Town in a lively, entertaining encounter at Hardenhuish Park. Goals either side of half-time from Karnell Chambers put the Bluebirds on course for would have been a hard result on the Cards, but a Jamar Loza brace, including a stoppage time leveller, rescued a point. Dowse made just the one change to the side that returned to winning ways at home Tuesday night against Hungerford, Jamar Loza returning in place of Nicky Wheeler, lining up centre of a three behind Jake Hyde, with Greg Luer and Duane Ofori-Acheampong out on the left and right respectively. With grey clouds beginning to gather on a cool afternoon, the players took to the field of play and gathered around the centre circle for a minute's silence, pausing for reflection of the previous week's tragic events in Leicester and with remembrance Sunday in mind as well. Brilliantly observed, the game then kicked off with the Cards winning the toss and opting to kick away from the slightly sloping Bristol Road End. Woking began the game well and took the game to a Chippenham side who initially seemed to struggle getting to grips with their own 'bobbly' pitch surface. Loza signalled his intent and capitalised on this in the opening few minutes, intercepting a sloppy midfield giveaway to then surge through the middle of the park, prior to then having a couple of shots blocked. The Cards maintained this momentum in the early exchanges as the home side still couldn't quite get a grip, guilty of surrendering possession numerous times. Woking by contrast looked to get balls quickly into the channels, Toby Edser pulling the strings. He took the best effort of the half for The Cards on 15 minutes, driving a dipping half-volley just wide from 20 yards out. As the half wore on Chippenham started coming back into the contest, persisting in going long, but with Jack Cook reliably winning the aerial battles. They then looked to get the ball into the right channel to Jack Compton, who delivered a series of dangerous balls in quick succession, a couple right across the face of goal narrowly averting contact, another having to be watched all the way by Craig Ross as it looped towards the left stanchion. Through Edser and Loza, Woking were still showing good endeavour to get forward, linking up on a number of occasions to Ofori-Acheampong who was proving a handful in his new role on the right side. Around the half-hour mark his persistence led to a stretched pull-back and half-chance for Hyde outside the six yard box. On the other side a quick Josh Casey throw caught the Bluebirds’ defence napping and set up Luer with another effort going out for a corner. In the lead up to half time, Chippenham’s intent and progress through the half went up a gear with Nat Jarvis heading a ball into the turf and just looping over the bar, the busy Compton then dragging a shot wide after cutting in well from the right. Woking were then punished on 37 minutes, a loose back-pass from a back-tracking Loza looking to reach Josh Casey was pounced on by Compton, whose effort on goal was parried by Ross into the path of Karnell Chambers who dispatched from the left side back across goal. It could have got harsher still for The Cards, a Compton through-ball putting it on a plate for Jarvis to convert, but his shot was denied by an excellent block by Cook. In an odd moment at the end of half time, the majority of Chippenham players and a handful of Woking's emerged ready for the second half only to be recalled to the changing room by match staff a minute later. One-liners such as ‘the ref isn’t ready’ and ‘one of the officials is injured’ were branded around but no one seemed to get a definite answer. A couple of minutes later, everyone emerged from the tunnel and we were back on. Not long after the restart, the Cards found themselves two goals down after a corner was not properly cleared following a couple of unconvincing aerial attempts to do so, subsequently falling to the feet of Chambers who converted his second goal of the game with a low effort into the bottom right corner. Chippenham full back Nuno Felix received a yellow card on 63 minutes for a high tackle on Edser, and it was during this stoppage Dowse made a switch, Paul Hodges coming on in place of Jake Hyde, therefore pushing Ofori-Acheampong back to his usual spot up top. The impact of the substitution paid dividends a couple of minutes later, a trademark Hodges surge through the middle fed Edser in the box but he was abruptly sandwiched by two Chippenham defenders. With usual spot-kick taker Max Kretzschmar not on the field, Loza calmly swept the ball into the bottom left corner. A few minutes later the aforementioned Kretzschmar was brought on in place of Luer. The goal back for the Cards really served to galvanise them for the remaining twenty minutes, vast amounts of play taking place in Chippenham’s half. Loza and Edser continued to be Woking's brightest sparks, both demonstrating great, acute footwork on the edge of the area to get past players, the former teeing up a chance for Ofori-Acheampong who stabbed a shot straight at the goalkeeper. The pick of the bunch of a series of effort from Edser was a tidy one-two with midfield partner Hester-Cook, the resulting shot dragging wide. The industry and turnaround of play from Hester-Cook wasn't going unnoticed; a great moment of composure and a neat turn fed Loza down the left-side, his cross blocked. Hodges presented a constant threat, almost getting reward following a jinking run, his resulting effort whistling past the post. Kretzschmar had a toe poke spiral awkwardly on target from outside the box, forcing a nervy parry from Brad House. On 79 minutes the Cards avoided a scare and worrying feeling of deja vu, this time Nathan Collier guilty of giving the ball away, and inadvertently teeing up a Chambers hat-trick through on goal, but the full back just about made it back to intervene as the trigger was about to be pulled. Save for this moment the Cards had been in the ascendancy as the half went on and got their just reward 2 minutes into 5 added on. After a spell of play in a congested penalty area the ball broke to Loza on the left and his effort flew past the keeper via a deflection. Cue wild celebrations from the away support behind the goal, who had been in great voice throughout the afternoon. As Woking then searched for a late winner their cause was further aided with the dismissal of Callum Gunner, receiving a second yellow card having being cautioned midway through the first, for cynically bringing down Hodges during a trademark run. Further self-inflicted punishment nearly followed for The Bluebirds in the dying moments as Ofori-Acheampong looked to have been pulled back in the area, but the referee did not want to know. On a tricky surface and against tricky opposition, Dowse can reflect that this is a good and deserved point on an afternoon where individual mistakes cost the Cards from maybe taking more, but his side clearly demonstrated great character to get back into the game. On another afternoon the endeavour and good work in the middle of the park might have led to more goals but, on balance, it was a spirited display continuing from the emphatic win in midweek. We now take a break from the league and return to FA Cup action next week at Torquay. Man of the Match: Toby Edser, just edging it from Jamar Loza. Really came to the fore in the midfield for the Cards today, expressing his quality passing range and close control, also showing real energy and endeavour throughout the 90 minutes. On a windy Saturday afternoon in Wiltshire, Woking took on Chippenham Town, coming from 2 goals down to draw 2-2 with a last minute own goal securing a point for the Cards!